Well, the Tour de Fleece has been great for helping me get back to my spinning. 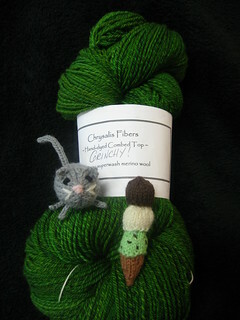 I finished spinning the green fluff I started last year. The spinning went well, and the dye that transferred to my fingers and hands as I spun let me know that finishing the yarn was going to take eleventy-bazillion rinse cycles. Actually, it took a few more than that, but I like the finished yarn, so it was worth it. This is a three-ply, and the fiber is superwash merino. I know superwash can be a bit of a coin toss, but I like this. At a certain point I felt like I was never going to finish, and my Celestarium was sitting at about 33% completion. So, I decided to get something tiny on the needles, and now I have a little fat cat and ice cream cone magnets for the refrigerator. I guess I will take a dive into the fiber bins and see what wants to be spun next. I suppose it would be helpful if I found my little scale so I can better divide the fluff, but I won't let that hold me back from getting something on the wheel. I haven't really given much thought to what I will spin next, but I know the stash holds many wonderful possibilities. I hope you are all having a joyful July and your time on the Tour has been smooth.